When Penny got the red-cover book on chinese cooking, we took immediate delight in the chinese poached chicken technique. The chicken may be brined if you want, but it must not be frozen when you start. Penny liked to remove the kidneys from the cavity – a spoon handle or fingernail works for this gross job, followed by a rinse with cold (and hopefully chlorinated) water to clear out the cavity (which of course you’ve emptied, because you wouldn’t think of cooking a paper-wrapped chicken liver in the same water as the rest, right?). 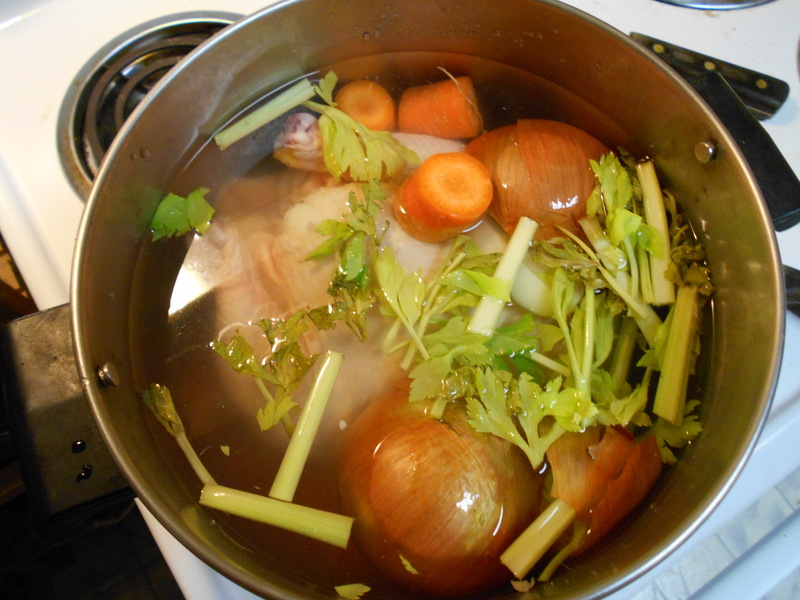 It helps to have a stockpot – it works best in one, but you can do it with a soup pot but you’ll have to monitor the temperature more carefully – and it also helps to know how much water will be displaced by the chicken, because you want to fill the pot with water to the point where it will cover the chicken entirely, but not much more. You can find this by measuring with the chicken in the water and marking or measuring where the water comes to, but then you’ll need to dump the water and restart because otherwise you get froth from the chicken blood. So, do it once and memorize or write down where the water needs to be with the pot empty. 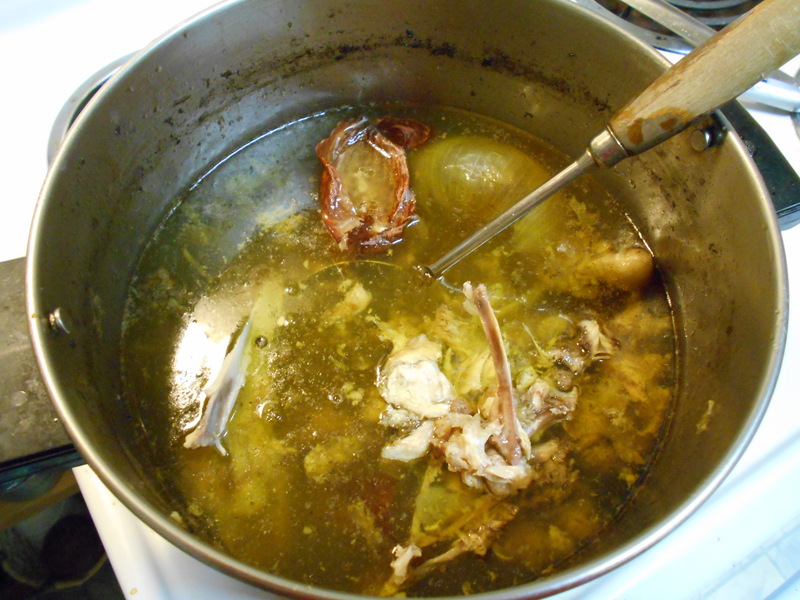 Fill the stockpot with fresh water – we had weird tasting water so we would filter it, which was a pain, but necessary. Toss in a whole green (spring) onion, a quarter-sized slice of fresh ginger root, and possibly a single lightly mashed clove of garlic. Bring to a full boil. Once again, if you’ve got chlorinated water, since the chicken has been coming to room temperature, rinse it thoroughly to greatly reduce the unwanted bacteria. Note that this works at close-to-sea-level. At high altitude, you may need to bring the water to a boil and hold it at a boil for ten minutes. If you do, you will need to scoop the foam off. But you will also still need to cover, turn off, and leave undisturbed for 45 minutes anyway. At this point you have a poached (NOT BOILED) chicken. The thighs and the breasts will all be equally perfectly done, and not dry. However, to get the full experience, you should immediately remove it from the water (which can be done by dumping it into the sink into a sturdy colander, if you have one and then dunk it immediately into an ice-water bath. 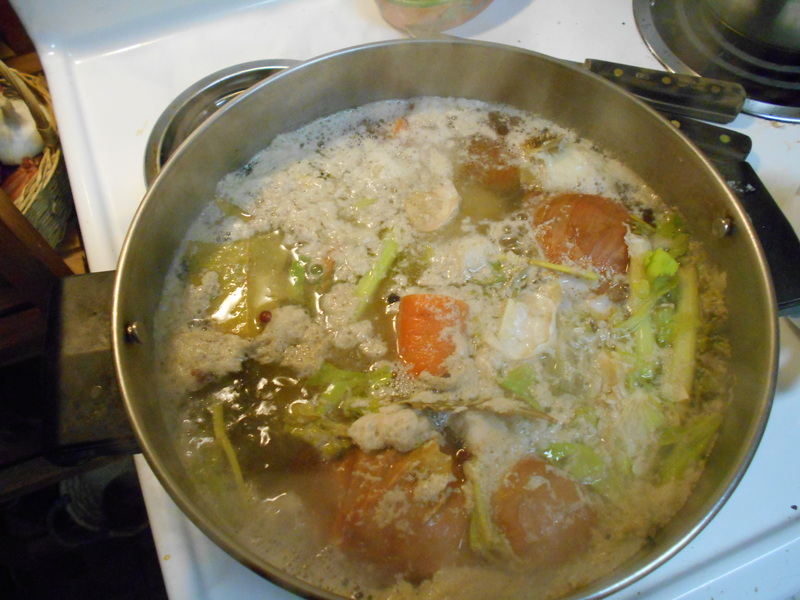 The ice-water bath will do two things: Stop further cooking, and cause the stock under the chicken skin to set quickly into an aspic, protecting it from drying out. 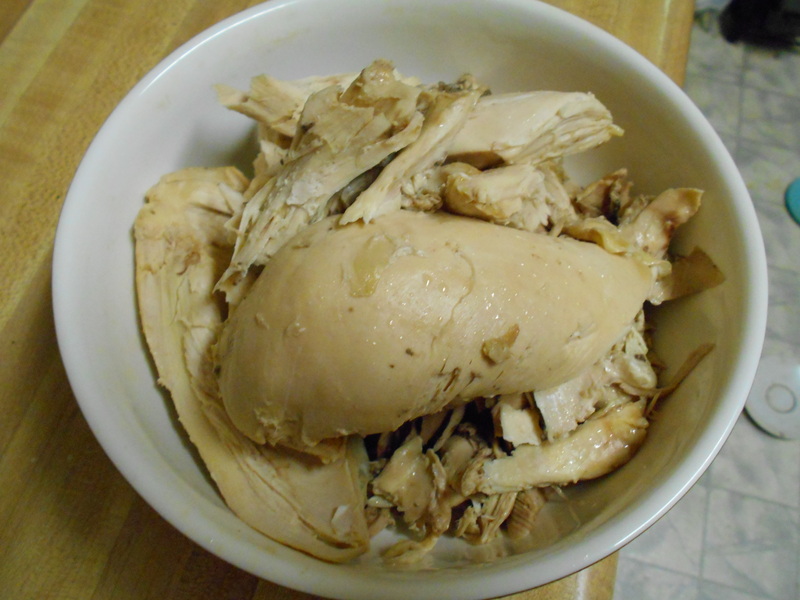 After four or five minutes in the ice bath, it’s traditional to pull it out, dry it off with a clean dry kitchen towel, and lightly oil the chicken with peanut or sesame oil, to prevent the skin from drying out and becoming nasty. 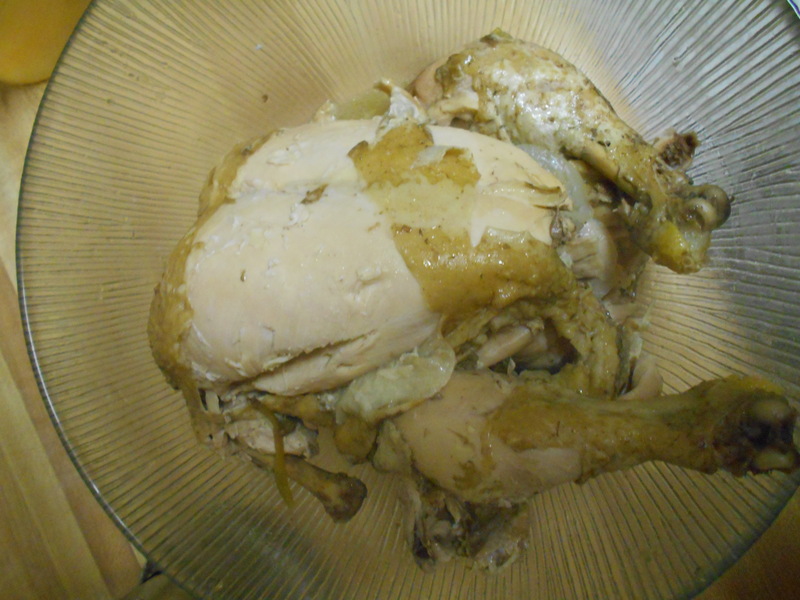 It can be eaten almost immediately, or refrigerated for cold chicken dishes, or cut up and used in various chinese recipes that call for cooked chicken. It freezes OK, but is better unfrozen. We were able to keep it for up to a week in a (cold) refrigerator. It works better if you strip the meat from the bones first. This method works best with a 2.5 to 4.5 pound chicken. If your chicken did not cook thoroughly, you can still use it for ingredients, but you’ll need to do the final cooking step to the meat first.